FreeCell Wizard is a solitaire game that includes the popular game FreeCell and 15 other similar games, such as Sea(haven) Towers, Double FreeCell, and Penguin. FreeCell Wizard features lush graphics, large easy-to-read cards, sound, in-depth statistics, and a wizard that allows you to create your own freecell type solitaire games. FreeCell Wizard game numbers are compatible with the game numbers in Windows FreeCell. Furthermore, FreeCell Wizard keeps detailed statistics of all games played! The game numbers in FreeCell Wizard are the same as the games in the FreeCell that comes with Windows. But FreeCell Wizard has not just 32000 games, not just 1,000,000 games, but over 2 billion starting positions! All the games under 1,000,000 are the same games as Windows FreeCell (meaning that game number #11982 is impossible). Is a highly enhanced version of the popular windows solitaire card game. 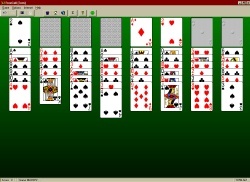 Is a Microsoft Windows based Solitaire Card Games . Qweas is providing links to FreeCell Wizard 3.1 as a courtesy, and makes no representations regarding FreeCell Wizard or any other applications or any information related thereto. Any questions, complaints or claims regarding this application FreeCell Wizard 3.1 must be directed to the appropriate software vendor. You may click the publisher link of FreeCell Wizard on the top of this page to get more details about the vendor.